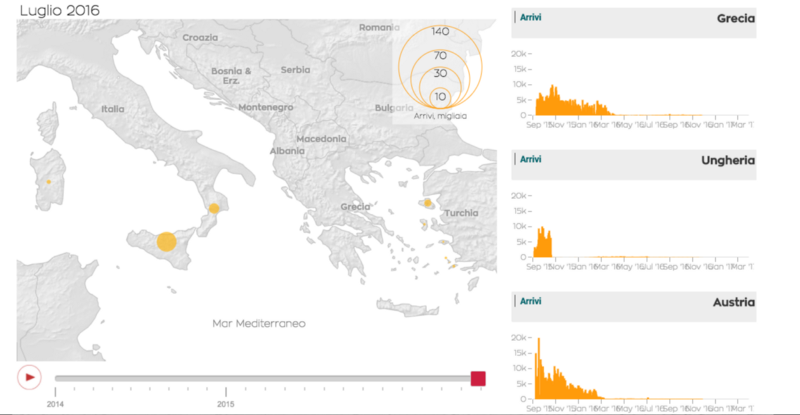 In early 2015, the Italian Coalition for Civil Liberties and Rights (CILD) launched Open Migration, an initiative that provides data and analysis on migration and refugee issues. “Back then (prior to 2015), the migration and refugee crisis was very emotional, in the sense that everybody thought it was a tragedy, of course, but everything that was put into the debate — especially by politicians — was just toxicity,” says Antonella Napolitano, Head of Communications for CILD. “We felt that the narrative was completely ideological, and completely detached from facts, numbers and the actual scope of the phenomenon.” To address this, CILD created Open Migration to develop a holistic knowledge base about the factual realities and the human aspects of a topic that is often generalized or even mischaracterized in media and policy. Open Migration, one of CILD’s main projects, provides journalists and the media, civil society organizations, policymakers, and the public with access to glossaries, infographics, multi-weekly posts, and a web review featuring a curated list of the top ten articles on refugees and migration of the foregoing seven days. CILD has quickly gained recognition in Italy and beyond for Open Migration because it forces the public to confront preconceptions about migration and refugees. Napolitano saw this firsthand at a recent literature festival when CILD hosted an information booth where attendees took quizzes that tested their knowledge on topics such as the refugee crisis in Italy and Islam in Italy. For example, the real number of migrants coming into Italy is a third less than what the media had been citing. She tells us, “People were drawn in because they were curious… and it was a way to challenge their assumptions. There were people that were critical, saying things like, ‘We want to help but there’s just too many.’ or ‘These people are stealing our jobs!’” The quizzes, based on actual data, demonstrated that facts differ from popular perception. Open Migration’s focus on the gap between perception and fact allows for a dialogue to be nurtured and demonstrates the role and responsibility that the media plays in the public consciousness. When journalists are more aware of where migrants and refugees are coming from, and the realities of the situations they are fleeing, the narrative shifts, Napolitano explains. “We’ve been noticing over time that there are a number of stereotypes that are no longer used, or used much less. And so you push on, and the narrative slowly changes. Nobody would go on TV now and say there are 5 million people coming in this year, the correct numbers have been circulated and repeated so much they are known.” CILD’s advocacy efforts along with Open Migration’s focus on data are playing a major role in how information and advocacy are presented in the refugee and migration crisis. The challenges that come from working on migration in the current global climate are still massive. Populism, Napolitano says, is here to stay. “I feel that even the moderate parties are chasing those people electorally…even from center right or center left…so you have to be ready to challenge the kind of talk that seems smaller and sensible, but in the consequences might be harmful in a different yet significant way.” Napolitano warns that we’ve seen these issues before, and the lessons learned are that we should not be pitted against those who have challenges, or submit to fear or anger. To avoid indifference to the plight of those who have less opportunity and less of a voice, we must show solidarity and challenge mainstream views that make us comfortable. Napolitano believes that the best way to move forward and have these conversations is to challenge with facts and move forward in a manner that shows an openness to discussion and partnership. Taking strong stances and working transparently both inside and outside of political systems is also necessary. In the wave of populist nationalism that has made itself known in various countries recently, rhetoric has become the biggest weapon of all. Learn more about CILD’s work and explore Open Migration, and read more about Humans on the Move’s panel The If and When of Technology for the Global Refugee Crisis at Personal Democracy Forum 2016, and joint event Cities for All: Integration, Innovation, and Investment at Impact Hub Milan.